Discover the benefits of a Swedish massage this month with our June offer. Swedish massage was developed, not surprisingly, by a Swede, Per Henrik Ling. It stimulates the body’s circulation and so helps cleanse and nourish soft tissues by bringing more oxygen and nutrients to cells. It relaxes tense muscles and improves muscle tone. It stimulates the body’s system to greater efficiency. Great for relaxation, improving sleep patterns and the relief of muscular tension. Treatment begins with effleurage, followed by kneading, friction, vibrations and percussion techniques. So set aside an hour this month to have your muscles soothed in our expert hands, and at a discount too! 40€ instead of 50€ for a one-hour Swedish massage. Valid up to and including 30th June 2018. Just call 06.47.14.06.03 for an appointment. In case you missed it, here’s a reminder of our latest offer. Learn basic massage techniques with a professional massage therapist and reap the benefits both at home and at work. According to new research from Northumbria University, couples who took part in a three-week basic course not only reduced stress and improved their well-being, but also felt more satisfied with their relationship. If you live in and around Mérignac and Pessac, you can now contact me for courses with you and your significant other, all in the comfort of your own home. You can learn the basics in a just a few hours, and get a massage into the bargain! Effleurage, pressure strokes, hacking, friction, kneading; all these words will suddenly take on a new meaning. As a couple, you’ll learn how to give your partner a relaxing back massage*, relieving knots in the neck and shoulders, reducing tension in the lower back, taking it in turns to massage each other. And the big plus side is that you’ll be massaged half the time by your other half, it’s a win-win situation! No need for you to move from the comfort of your own home, just a phone call to make and your massage lesson is booked. No running about trying to get the kids looked after, no time lost in traveling to and from your appointment, no traffic jams, no worrying about being late, no parking nightmares. 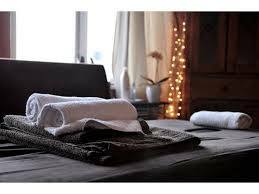 All necessary material brought to your doorstep on time, every time – massage table, oils, clean linen. You should allow a maximum of two and a half hours for a 2-hour lesson (for setting up and changeovers) with 2 full hours of massage included (1 hour per person). Special introductory offer 75€ instead of 90€ per 2-hour lesson. Offer valid until February 28th 2018. You can offer a massage lesson as a gift voucher (as with all our massages). * You can also ask for a lesson on massaging the arms, neck and head; or the feet and legs. No need for you to move from the comfort of your own home, just a phone call to make and your massage lesson is booked. No running about trying to get the kids looked after, no time lost in travelling to and from your appointment, no traffic jams, no worrying about being late, no parking nightmares.